Each year the Bath Canada Day Committee honours an individual, a group or a business whose dedication to the community makes Bath a better place to live. In 2018 we honour the work of the Bath and District Lions Club for the many projects they undertake every year that contribute to the health and well-being of the residents of the area. 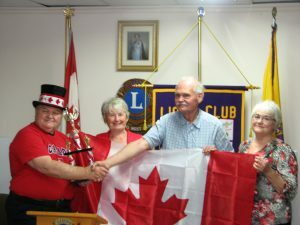 Vision screening, the waterfront playground, the Christmas Baskets and their support for Bath Canada Day – all of these efforts are valued by Bath residents. And that’s BEFORE they gave us a cheque for $925 ! Joe Hudacin presented the award to Don Jones, President of the Bath and District Lion’s Club. In 1980, Joe was the councilor for Bath and in that capacity attended the founding meeting on the Bath Lions Club. The Bath Canada Day website was designed and created by Wavelength Media.